Over the years people have asked me for the extra search features I have on my test box. Now that we can use page fragments to add pieces in I'm a little more comfortable publishing these for everyone. Enhanced Search adds in some drop downs to the home page allowing your users to search by some frequently used fields. It also adds in a "View Function List" option that works much like the "View Field List" link except that it displays the different search options for your users (ex: *birthday=today). This list may not include everything so feel free to let me know if there are any missing. You may install this as a plugin or unzip and install in the custom/web_root. Activities only show the correct ones for each school. Fixed issue where district office only showed district wide activities. Updated for PowerSchool 8. Converted during a class at PSUG-MI 2014. Quick question. I applied this customization and like it a lot. I have an out of district reportable "School" and when I select that school it brings up three kids who are supposedly enrolled at another school. So i looked at their transfer info and they are listed as OODNR, and then did a quick export on them and found (After searching through the html) that their School ID and Enrollment School ID dont match. Enrollment school id is not proper for those three kids. I can fix it, but I want to know how we got to the point where they were mismatched? Any ideas? I had to create that little "alert" for a school that uses a separate fake school for students who apply and then moves them into the real one once they've been accepted. They were having a lot of issues with students not having the correct settings. They utilized the Student Field Value function to change the schoolid once a student was enrolled but never changed the enrollment_Schoolid. Once they knew they had to the issue decreased but still happened on occasion. So this little "alert" lets them know if they forgot something. I did tell them they should drop the student then move to the real school and re-enroll but they didn't want that hassle for the new students and they didn't want the re-enrollment record for the time spent in the application school. Perhaps this is your problem too? Maybe someone used student field value or DDA to change one schoolid and not the other. We had the same issue when we started a Year round building along with the regular one - found the enrollment school id did not get changed - and just an FYI - The Enrollment summary report runs on enrollment school ID not student schoolid - figured that out when their numbers were all off - This red alert really helps. Hi Jason, you should ask Brian Andell for the amazing page he wrote for us at PSU a few years back. We use a "fake" school to register all our students. And we wanted to move them to their assigned school without creating an enrollment record for our "REG" school. We didn't want "REG" school on their enrollment record. Poor Brian got stuck with me one evening at open lab at PSU. In 2 hours Brian created a "Move From Reg School" page that transfers the students to their correct school without creating another enrollment record. His page prompts for the targett school and year. Then it changes the schoolid, the enrollment_schoolid, changes dropdowns for the FTEid to the correct FTE for the target school and year, changes the dropdowns for the grade levels to the grade levels available at the target school. It allows updating of the entrycode, the enroll_status and the entrydate. So it cleanly moves the student to the target school. VERY cool. 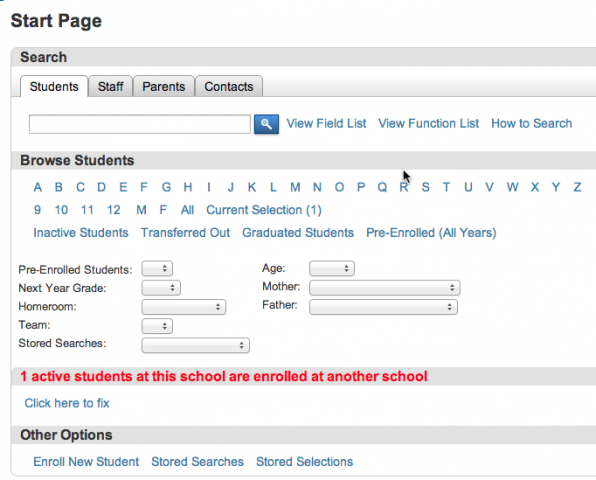 I think this enhancement could be useful to districts who use a fake school to register students. Perhaps you could persuade him to share it. If he can't put his hands on the code, I can send it to you. Love the enhanced search. Is there a way to add a dropdown that selects by activity. So you could just select, band, track, etc. This is a great idea. I'm going to check and if it's possible I'll add it. Since PowerSchool changed where activities are stored I just want to double check before giving you a definite yes. The customization has been updated with the activities search added in. Thanks for the great idea. For some reason, stored searched are all returning 0 results when using the dropdown from this enhancment. If we run stored searches using the normal method, they work fine. I have successfully installed the plugin. However, I don't see any of the enhanced features. When I look in CPM, the custom pages don't share there. Do I need to install the plugin and add the custom pages to CPM? This may sound like a weird question but did you click the enable plugin after installing it and answer yes to the 'use of custom ' window. I have installed the plugin, but the only part that shows up is the Red Enrollment error. I don't get any of the search options. Great job on this, Jason. Looking forward to that PS 8 version. Does this customization work on PS 8 yet? I just tried on 8.0.0 and it does not work. It would be nice to have this extended search pane display or not display sort of like the little triangle buttons (hide/display). Hello Jason I am at the PSUG NJ conference and uploaded this plug in. I had an older version and got this Errors were found during plugin installation. So I deleted them from CPM and installed the plug in and it is still not showing up. please help! Way to make checkboxes cumulative? Hi Jason. Love this customization. Is it possible to make it so that the checkboxes are cumulative? For instance, you want to look for in a certain activity or certain age but also only those in 8th grade. The Stored Searches are still coming up blank when I run them from the Enhanced Search screen (for PowerSchool 7). Everything else works great!! Clicking on the link on the functionlist_yui.html successfully copies the search over to Search Students but the search just returns all students. If I copy the search and delete and re-add the equal sign at the end, then it searches correctly. Thoughts? I just installed this to test on my test server. Everything is working great except for the Pre-Enrolled Students drop down. I have 2 pre-enrolled students on my test server but the drop down shows 3 identical 16-17 in the drop down. No matter which one I click it shows the same 2 students. I am just wondering why there are 3 listed? We are on PowerSchool 10 and when I installed the updated plugin (2.0.0) it installed and worked just fine. The problem is that is slowed PowerSchool down so much that it was almost non-functional. It would be a great resource to us to have that enhanced search feature (especially love the teams and the activities!) for our system, but I have had to remove it. Is there a newer version coming out or has this been an issue since PS has been updated to 9.0 and higher? Please help--we would love to utilize this! Hi Jason, Same question as above, is there a new version coming out soon? Our schools miss the items in this plug in, but the issue of slowness over rode any feature we loved. Was the download for this removed or am I blind?